This famous book was the first treatise on Lie groups in which a modern point of view was adopted systematically, namely, that a continuous group can be regarded as a global object. To develop this idea to its fullest extent, Chevalley incorporated a broad range of topics, such as the covering spaces of topological spaces, analytic manifolds, integration of complete systems of differential equations on a manifold, and the calculus of exterior differential forms. The book opens with a short description of the classical groups: unitary groups, orthogonal groups, symplectic groups, etc. These special groups are then used to illustrate the general properties of Lie groups, which are considered later. The general notion of a Lie group is defined and correlated with the algebraic notion of a Lie algebra; the subgroups, factor groups, and homomorphisms of Lie groups are studied by making use of the Lie algebra. The last chapter is concerned with the theory of compact groups, culminating in Peter-Weyl's theorem on the existence of representations. Given a compact group, it is shown how one can construct algebraically the corresponding Lie group with complex parameters which appears in the form of a certain algebraic variety (associated algebraic group). This construction is intimately related to the proof of the generalization given by Tannaka of Pontrjagin's duality theorem for Abelian groups. 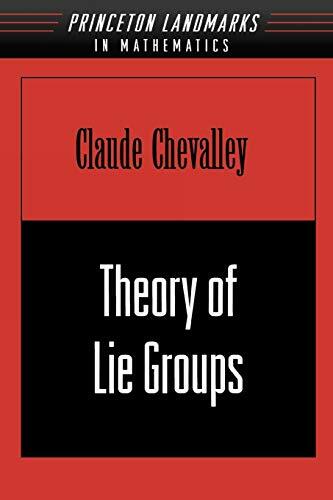 The continued importance of Lie groups in mathematics and theoretical physics make this an indispensable volume for researchers in both fields. Claude Chevalley (1909-1984) served on the faculty of Princeton University and was resident at the Institute for Advanced Study. He was a member of the Bourbaki and was awarded the Cole Prize of the American Mathematical Society.